A new RMA survey that monitored 7,000 vehicles found that almost 11% of drivers are riding on at least one bald tire. When it comes to tires, bald is definitely not beautiful. In a study that should be distributed far and wide in the wake of announcing the dates for 2010 Tire Safety Week, a new RMA survey found that at least 11% of motorists in the U.S. are driving on at least one bald tire. Driving on worn tires is especially dangerous during this time of the year, when wet or icy road surfaces pose even greater difficulties for worn tires that are past their functional prime. Bald tires are susceptible to losing grip on the road on wet roads, causing hydroplaning and loss of control that can easily lead to a crash. Hydroplaning is a dangerous occurence that involves the vehicle riding on a thin film of water, not the actual road surface. Bald tires that can’t efficiently move water can hydroplane quite easily. The RMA urges motorists to monitor the tread depth on their tires to make sure it is always above the legal 2/32 inch. In addition to checking tire tread, drivers should also keep an eye on tire inflation. Bald and underinflated tires are a recipe for disaster for you and everyone you share the nation’s roads with. Recommended reading: How To Properly Maintain Your Tires. June 7-13 is National Tire Safety Week in the U.S.
National Tire Safety Week, taking place this year in June for the first time, is a 7 day nationwide event held to raise awareness about proper tire maintenance and safety practices. This industry event has been sponsored and coordinated by The Rubber Manufacturer’s Association for 8 consecutive years. If you own a wholesale tire business or retail shop, this week is a great time to get involved in the effort to educate your customers. Customers who learn about the importance of tire safety and vehicle maintenance are more likely to use your services, so why not be the one to do the educating? To get involved during National Tire Safety Week, consider printing up some brochures and reading material for your customers. You can include common tire problems and safety tips that will help them drive safely. To really fuel your marketing efforts, consider buying imprinted tire gauges with your company name and telephone number on them. By giving out a tire gauge to your customers you create a lasting impression and increase the odds that they will remember your company the next time they need to purchase tires or have their vehicle serviced. Welcome to a new series of posts on Tire Blog which will include an ongoing list of the most important tire safety tips. The first tip in this series is simple, easily overlooked, but very important: Make sure you check your tire pressure at least once per month. Maintaining proper inflation of your tires is critical to ensuring that they can do their jobs effectively. In fact, according to the National Highway Traffic Safety Administration, underinflation is the number one cause of tire failure that results in auto accidents. Your tires may lose pressure for any number of reasons, including the natural leakage of compressed air through the porous tire membrane. Tire pressure can also decrease in cold weather or as a result of structural damage to the tire itself. An underinflated tire will not provide the level of crisp handling that it is designed for. 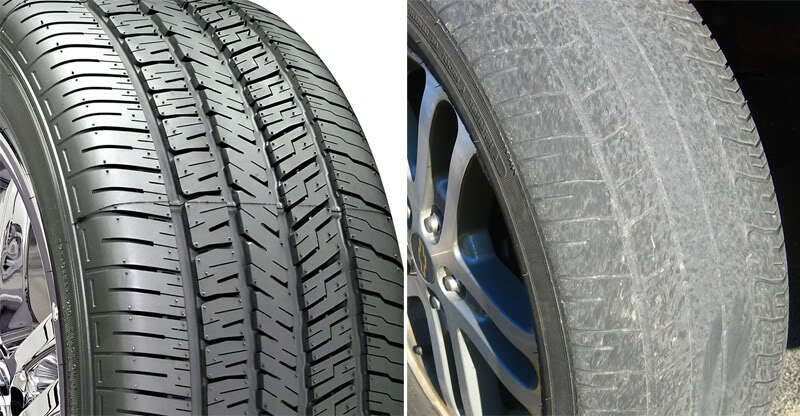 Over time the tread will begin to wear out unevenly, and if not remedied quickly, the tire may become unsuitable for driving. Due to all of the safety concerns involved with properly inflating and maintaining your tires, it’s essential that you keep an eye on tire pressure and use a gauge to check air levels at least once a month. If you are planning on taking a trip over 200 miles, it’s recommended that you inflate your tires before you set out on your journey. Many drivers complain that their tires don’t seem to maintain a steady pressure over time. This is perfectly natural, and it’s due to the fact that the small oxygen molecules in compressed air can easily leak through the porous material of your tire over time. If you’re interested in spending less time at the air pump, spending less money on gas, and replacing your tires less frequently, consider filling your tires with nitrogen. Nitrogen molecules are larger than the oxygen molecules found in compressed air, so it’s much harder for them to seep out of your tires. This results in an optimal pressure being maintained for much longer than usual – usually 3 to 4 times longer. Over time this benefit translates into less wear and tire on your tires and better gas mileage. If you do decide to opt for nitrogen in your tires, it’s still a good idea to check your tire pressure regularly. Don’t let nitrogen lull you into a false sense of security regarding how long your tires can maintain their optimal PSI! As the trend continues to grow, expect to see some manufacturers shipping tires pre-filled with nitrogen directly to wholesale tire distributors in the near future. When cold weather comes around, it’s important to pay careful attention to your tires, especially your tire pressure, to avoid unsafe conditions before they develop. Aside from bumpy roads, ice, and fresh potholes, cold weather also threatens the integrity of your tires by causing the air inside to contract – 1 PSI for each 10 degree drop in temperature. It may not sound like much, but if your tire air pressure was low to begin with, the cold can exacerbate the problem. When the weather gets really frigid and temperatures dip below zero, make sure to check the rim of your tires where the rubber meets metal. At these temperatures, the tire stiffens and the seal at this juncture begins to loosen. Some people report completely flat tires with no evidence of structural damage to the tire and wonder what happened. It’s likely that cold weather allowed air to escape through this loosened seal. Aluminum alloy wheels are the most likely victims of cold weather tire pressure drops, and unfortunately, they are the kind used on most vehicles today. It’s a bit harder to get a proper seal when constructing an aluminum alloy wheel to begin with, and it’s even harder once road salt and other debris begins to eat away at the metal. Once this happens, air is more likely to leak out of tiny gaps created on the chipped surface of the wheel. Of course, hitting winter potholes doesn’t make matters any better! To combat tire damage and deflation during cold weather, make sure to keep a constant eye on your tire pressure. When temperatures drop below zero, check the seals on the tires to make sure they aren’t allowing any air to leak out. If you do discover a leak, it might be a good idea to purchase snow tires, which not only help with traction on icy roads in the winter, but are better at dealing with the rocky road conditions you’re likely to encounter.